The Immunization Division's goal is to increase immunization rates and reduce vaccine preventable diseases. Visit Hepatitis A Outbreak for the latest information on the recent outbreak. Does Your Back-to-School Checklist Include Vaccination? From newborns to college, you can help protect your children from 16 serious diseases by getting them vaccinated. Make sure your kids get any needed vaccines before the back-to-school rush! As a parent, making sure your children are vaccinated on time is an important step toward ensuring their long-term health. Vaccination also helps protest the health of classmates, friends, relatives, and others in the community. See our Back-to-School flyer here. 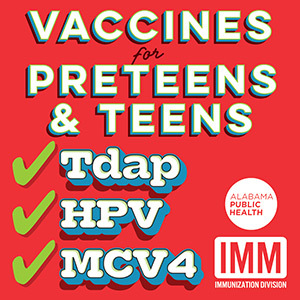 The Alabama Department of Public Health (ADPH), Immunization Division (IMM); Center for Disease Control and Prevention (CDC), Advisory Committee on Immunization Practices (ACIP); and the American College Health Association (ACHA) recommends that it is better and safer, in most cases, to vaccinate or revaccinate instead of titer testing. See ACHA Guidelines - Recommendations for Immunizations for more information. In addition, ADPH and CDC encourages all colleges to consider utilizing Alabama’s immunization registry, Immunization Patient Resources with Integrated Technology (ImmPRINT), to access all vaccine histories for all students. See our ImmPRINT Vaccine Coverage Rate Report flyer for information about comparing your practice's immunization coverage rate to that of the state and all providers in your county. To contact your local Immunization Compliance Manager (ICM), please view our ICM map to obtain the contact information. Guidelines for specific vaccines for preteens and teens have been established by the American Academy of Pediatrics (AAP) and other medical organizations. Tetanus-diphtheria-acellular pertussis (Tdap) or tetanus-diphtheria (Td) booster: The Tdap vaccine should be given to children aged 11 to 12 years. It can be given at 13-18 years if not received at an earlier age. Tdap can be given regardless of the time since receiving a previous Td-containing vaccine. The Td booster is used in persons who should not get pertussis vaccine. Meningococcal: The meningococcal conjugate vaccineis recommended for al l preteens and teens at 11 to 12 years old, with a booster dose at 16 years old. Teens may also be vaccinated with a serogroup B meningococcal vaccine (2 or 3 doses depending on brand), preferably at 16 through 18 years old. Any older teen who has never been vaccinated should get vaccinated as soon as possible. Human papillomavirus (HPV): The HPV vaccine is recommended for children aged 11-12 years so that they are protected before exposure to the virus. The HPV vaccine is given as a 2-dose series before age 15. Both girls and boys should receive 2 doses of the vaccine to prevent HPV-related diseases. Teens 13 years and older who either did not get any or did not receive all of the HPV vaccines when they were younger should complete the vaccine series. Adolescents older than 15 at the start of the vaccination series and young adults need 3 HPV shots for full protection. Influenza: All teenagers (and everyone else 6 months of age and older) should be vaccinated every year with influenza vaccine as soon as it becomes available in the community. About 10% of people with Meningitis will die, sometimes within 24 hours. Survivors may have brain damage, loss of limbs, and hearing loss. There are two types of Meningococcal vaccines recommended for preteens and teenagers. Learn more. You have the power to prevent some cancers in your children. There are two cancer-prevention vaccines available for your children, HPV vaccine and Hepatitis B vaccine. Learn more. Review the Notifiable Disease Rules requirements. Notifiable VPDs do not require the patient's permission to be investigated. To learn more review the HIPAA Letter. If you need your immunization record or Certificate of Immunization (COI), please contact the provider or county health department who administered your vaccines, or ask your current provider if they have access to Alabama's immunization registry, ImmPRINT, to locate your record. A Certificate of Religious Exemption can only be issued by a county health department. The parent or legal guardian must submit a written objection and receive education on the consequences of not immunizing their child. To make an immunization appointment, please contact your healthcare provider or county health department. Parents and guardians should ask for and keep a copy of your child's immunization record for future purposes, for example college or career. The Vaccine Adverse Event Reporting System (VAERS) is a national vaccine safety surveillance program co-sponsored by the Centers for Disease Control and Prevention (CDC) and the Food and Drug Administration (FDA). VAERS provides a nationwide mechanism by which adverse events following immunization may be reported analyzed, and made available to the public. VAERS also provides a vehicle for disseminating vaccine-safety-related information to parents and guardians, health care providers, vaccine manufacturers, state vaccine programs, and other constituencies. You are obligated to report all vaccine adverse events online. Please select this link to go directly to VAERS.